People are wondering, ‘Can he speak? Does he have 100 per cent mental capacity?’ The truth is, I never did. I might even be a few points higher. The things we find humorous are inconsistent and strange. Perhaps this is no better illustrated then by Tracy Morgan’s opening joke as he took to the Saturday Night Live (SNL) stage last weekend. Morgan truncated that bit shortly and moved on to gratitude – a very warm thank you to his comedy family of 30 Rock co-stars Tina Fey, Alec Baldwin, Jane Krakowski and Jack McBrayer, and nodding towards the gravity of the car crash that nearly took his life. In his past work, a pleasure of Morgan was the randomness of his person. He would be so still in the scene then issue forth with comic random hilarity, often times playing the simpleton who triumphs in the end. Last Saturday, we saw Morgan doing some of his established characters that helped him reach his fame, including Brian Fellow and Astronaut Jones. In some numbers his eyes were reeling to keep up and we wonder if he seems to grasp just the coattail of the scene. Yet in other numbers he sinks so deeply into character he all but disappears and delights us in his transformation. In the Safari Planet sketch, an un-cooperative camel took up the whole camera view, only to be taken off smoothly by Morgan in Brian Fellow character – hats off to him for cognitive flexibility! Perhaps Morgan has gotten a peak from the front row seats of his own personal apocalypse, as so many brain injury survivors have. But the unraveling of our person, and the memory of that view is nursed and subdued with laughter. Humour is the nursemaid of terror, and it is heartening to see people who call in our laughs benefit from the same medicine. This is not about whether Morgan has recovered or not. Many us living with brain injury know recovery is never judged by one thing, and the success we had before may not be the same ones in store for us tomorrow. It is the effort to continue reaching for what we desire and working with what we have. 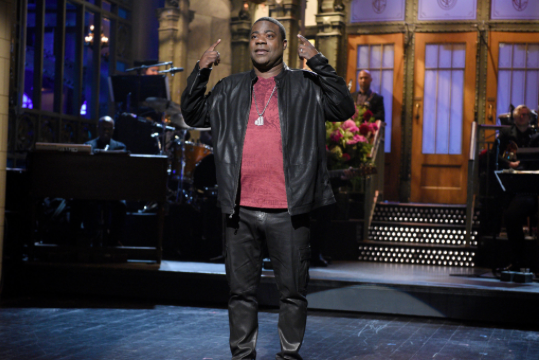 Tracy Morgan impressed and pleased me, working and striving to reach what he has reached. He stood up there with his quintessential Tracey Morgan style comedy and made me laugh. The ratings that night went through the roof. More importantly, he cracked me up. Coire Langham had brain surgery just over a year ago. On his good days he remembers that a new world is out there to explore. On his really good days, he forgets the world entirely and plays make believe with his three-year-old daughter outside in the sun.